Top Khmer Rouge leaders guilty Jump to media player Two top Khmer Rouge leaders are jailed for life after being convicted by Cambodia's UN-backed tribunal of crimes against humanity. 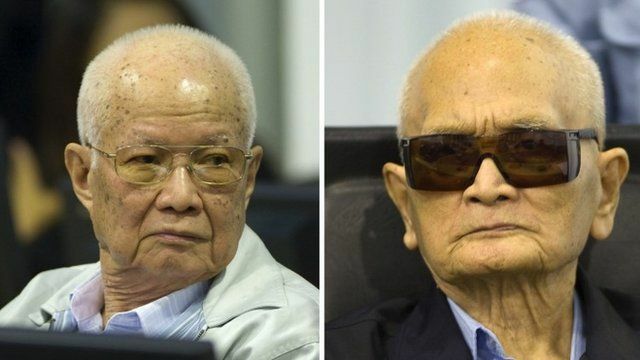 Khmer Rouge trial verdict due Jump to media player A verdict is due in the first trial of the last two surviving leaders of Cambodia's Khmer Rouge regime. Closing statements at Cambodia court Jump to media player A war crimes tribunal in Cambodia, backed by the UN, has begun hearing closing statements in the trial of Khmer Rouge members. 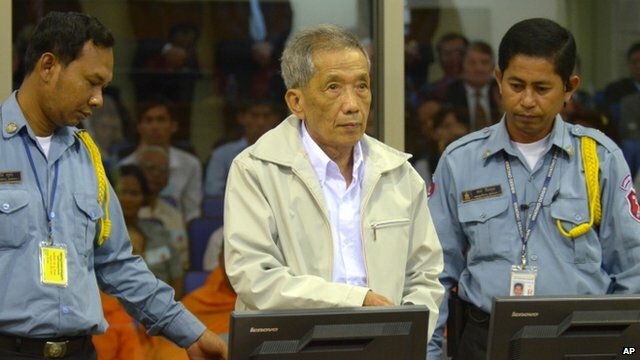 Khmer Rouge chief gets life sentence Jump to media player Appeal judges at a UN-backed tribunal in Cambodia have rejected a claim by the man who ran a notorious Khmer Rouge detention centre, that he was not responsible for the crimes. Playing flute to escape death camp Jump to media player Arn Chorn-Pond played the flute as a child to escape death in a Khmer Rouge labour camp. Nuon Chea served as Pol Pot's deputy and Khieu Samphan was the Maoist regime's head of state. Up to two million people are believed to have died under the Khmer Rouge regime. Jonathan Head reports from Phnom Penh.